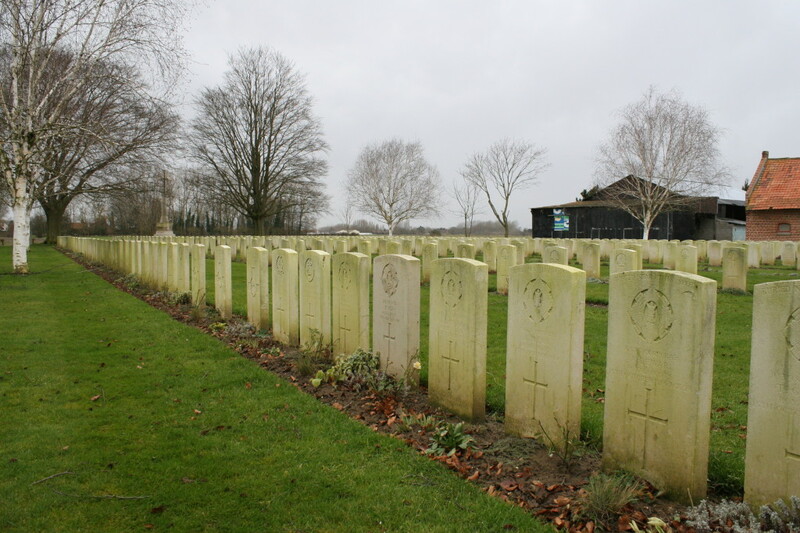 You may remember, a little while ago now, that we visited six cemeteries that lie between Ploegsteert Wood and the Franco-Belgian border, which, in this part of Flanders, follows the course of the River Lys (or Leie, if you prefer). 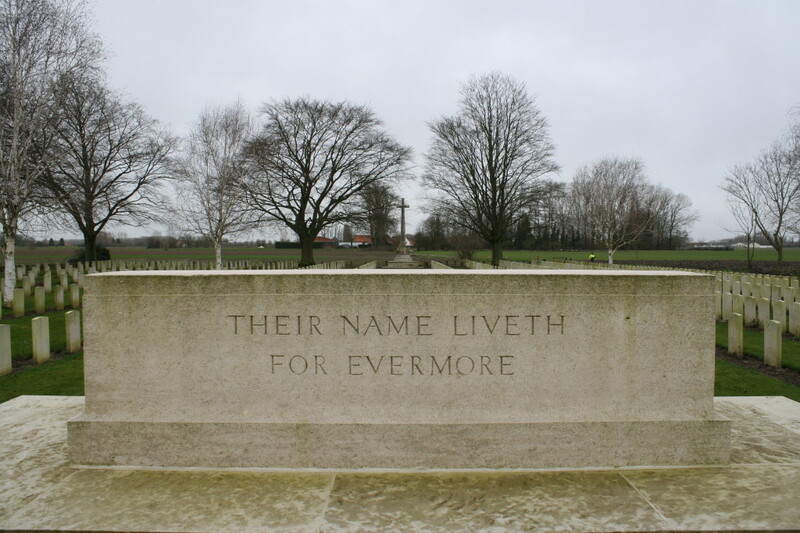 It’s high time we visited the cemeteries immediately south of the border, in French Flanders, and on this tour we shall. 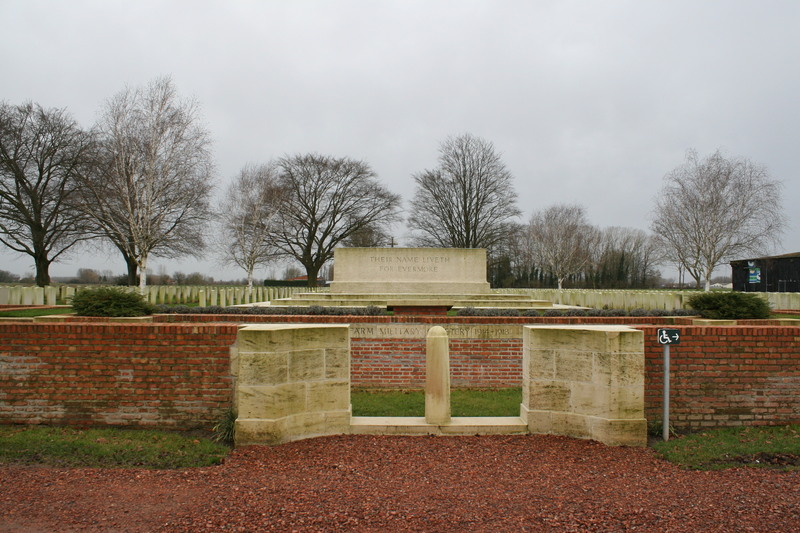 Beginning three miles south of the border at Bois-Grenier, our route will take us north east, through La Chapelle d’Armentières, towards the border town of Houplines, today pretty much a suburb of the much larger town of Armentières. 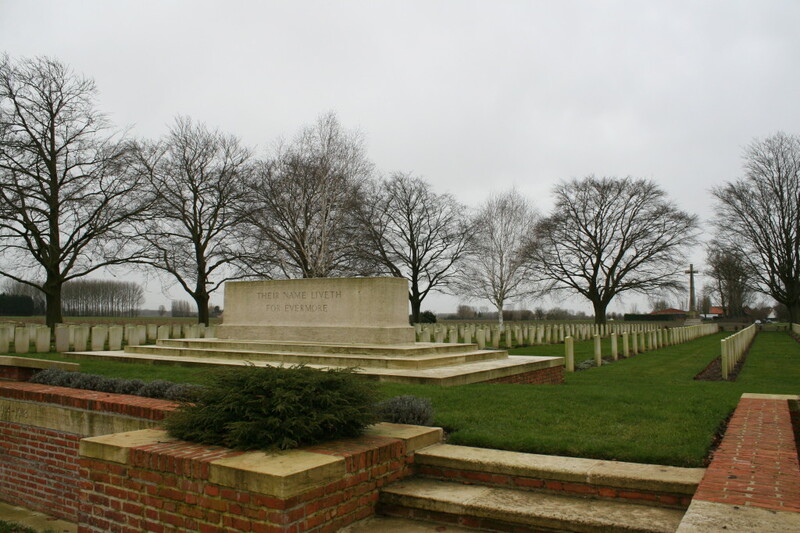 It’s only a few miles as the crow flies, but on the way we’ll visit a dozen British cemeteries which roughly follow, or at least parallel, the line of the trenches as they once wound their way from the battlefields of Fromelles and Aubers, a little further to the south, as far as the River Leie in the north. 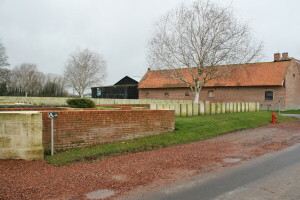 The seven or eight miles between Fromelles and Ploegsteert Wood, and in particular these few miles of trenches south of the river, were considered safer than most, and for this reason many troops gained their first experience of trench warfare here, to prepare them for life in tougher sectors elsewhere. The Australians, during their tenure of the line here, went so far as to refer to it as the Nursery Sector. 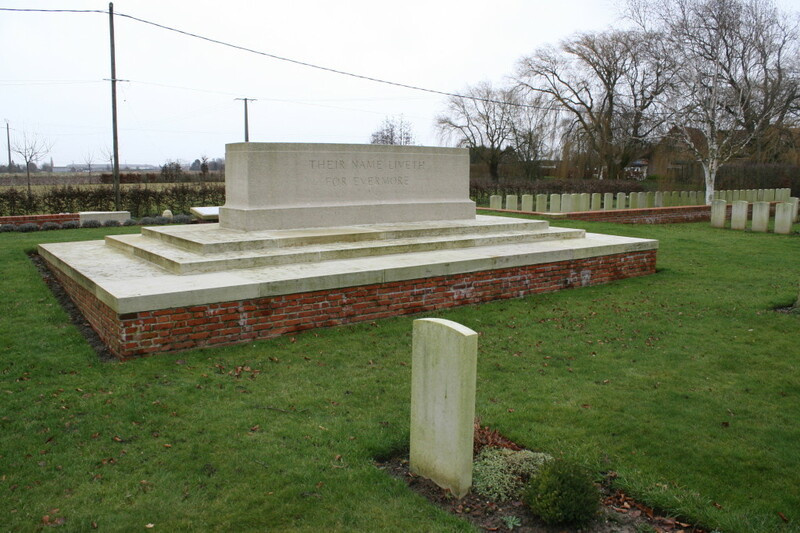 Of course, men died here every day, but as a result of the day-to-day fighting that took place all along the front line, as the result of shellfire, from snipers’ bullets, and on the trench raids which both sides insisted on carrying out on a regular basis, but not as a result of orchestrated battle. The front lines here hardly changed throughout the war until the German advance of April 1918. 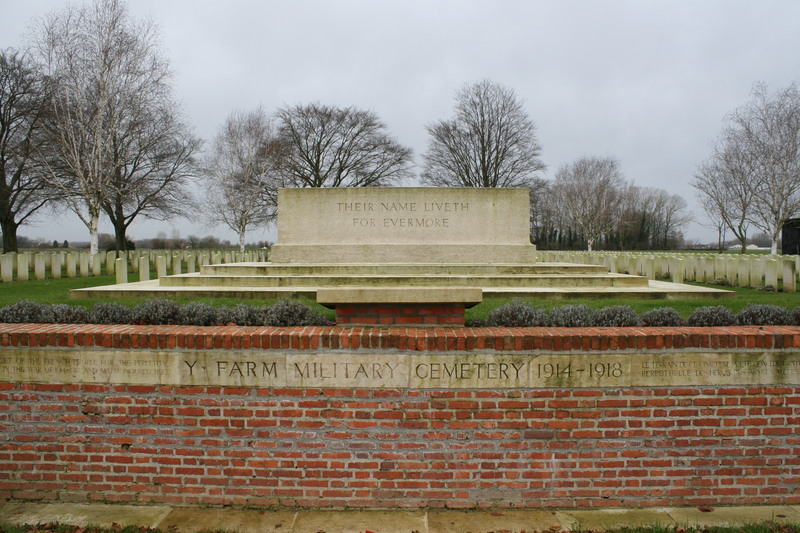 Our first stop, Y Farm Cemetery, was begun in March 1915 and used until February 1918. 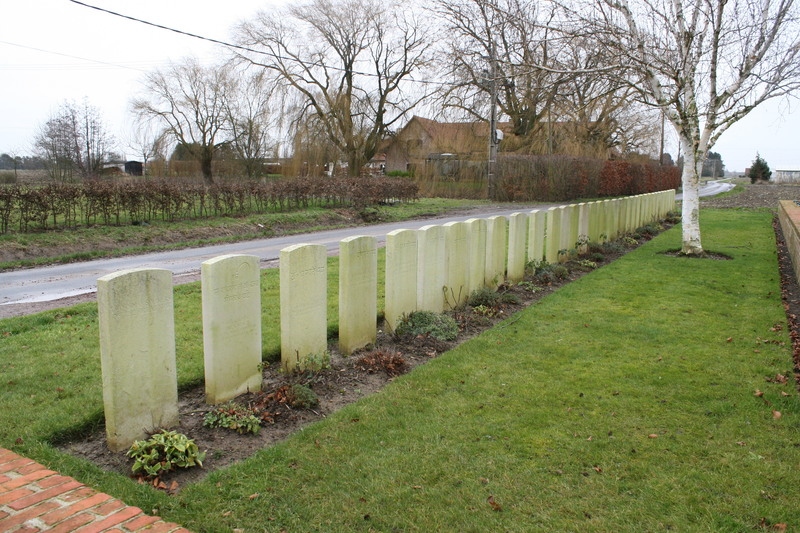 Above & below: On either side of the cemetery entrance, although actually outside the boundary wall, a long row of Indian graves, quite a number unidentified, date from the first year of the war. 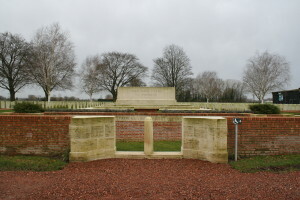 Stone of Remembrance, with some of the Indian graves visible beyond the cemetery wall in the right background. More early graves. 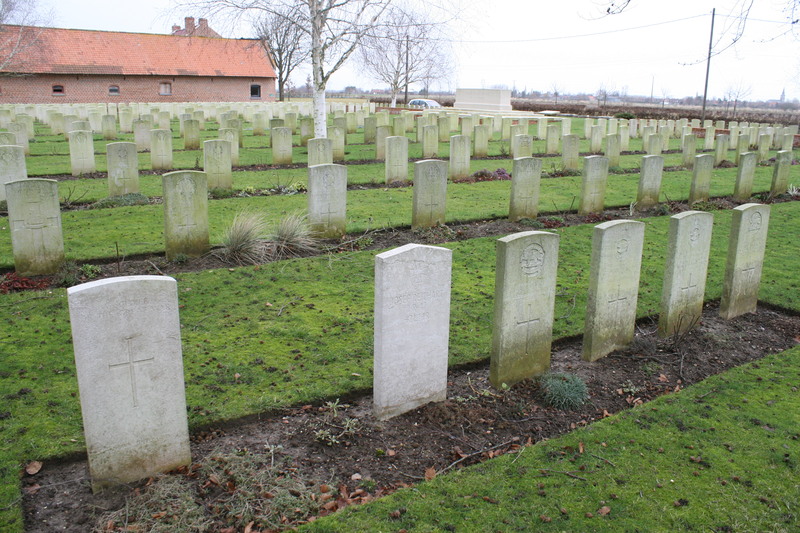 Royal Scots in Row J, all killed on 15th November 1914. View from the eastern corner of the cemetery. 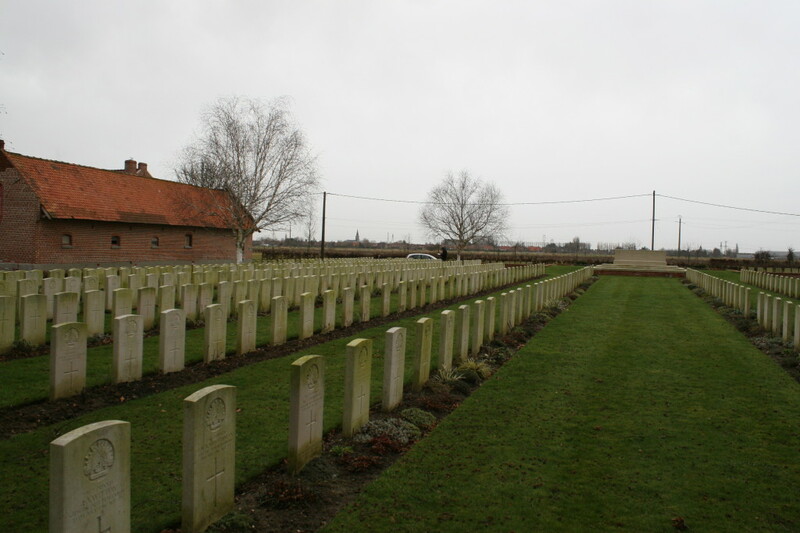 Unusually for a cemetery of this size, the burials at Y Farm are not sub-divided into plots, the cemetery consisting of 13 long rows of headstones, a small Row A along the northern boundary, and the Indian graves we have already visited, as you can see if you check out the Y Farm Military Cemetery Plan. 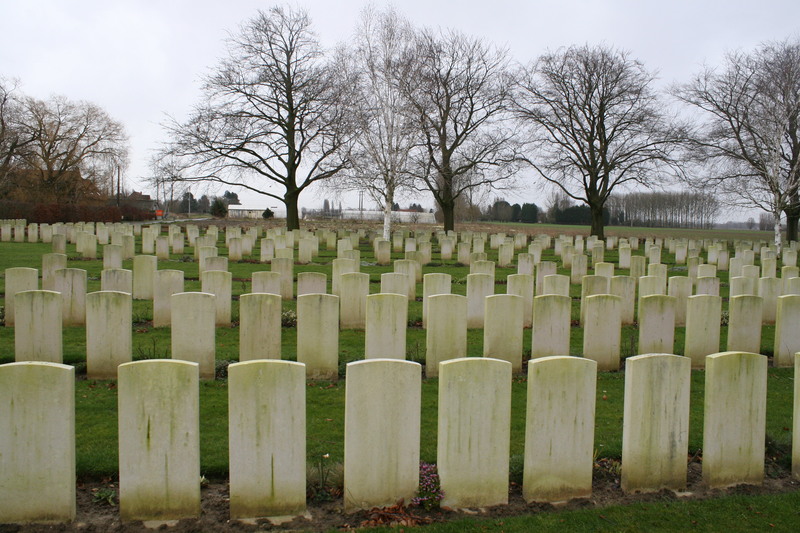 Nearly three hundred of the burials here are unidentified. 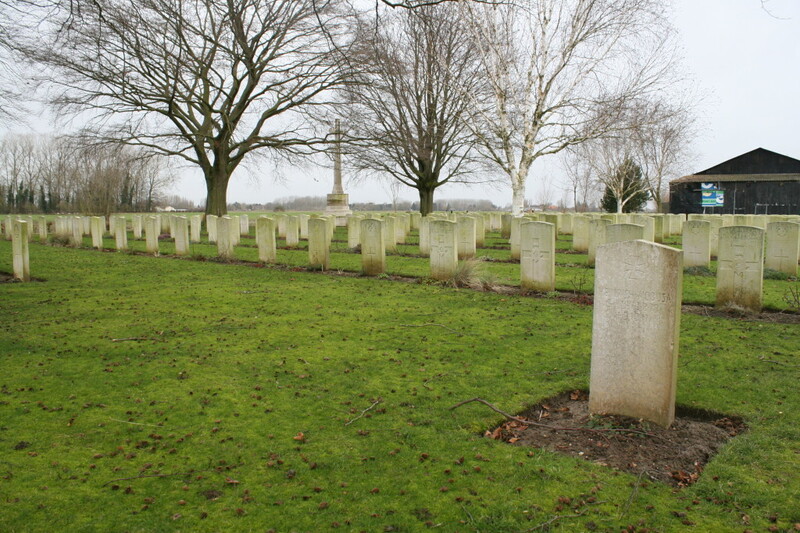 …and this looks west, another German grave in the foreground. 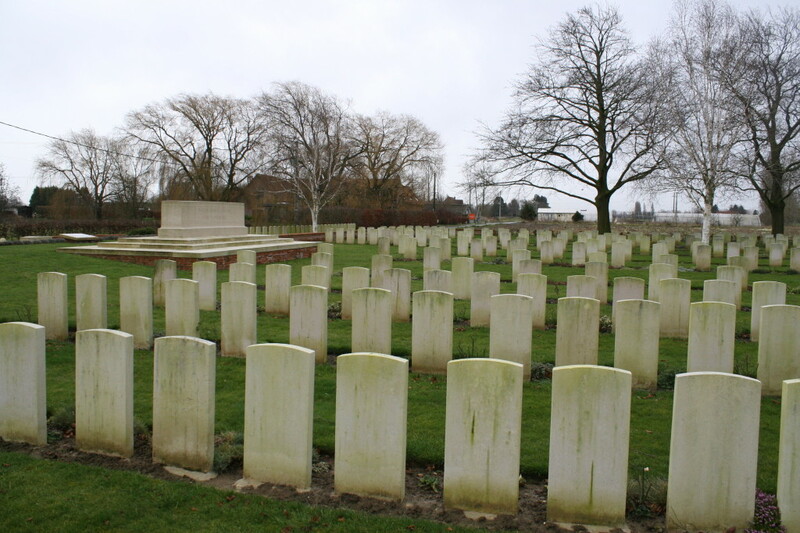 91 Australians are buried here, nearly all killed during the spring and summer of 1916. 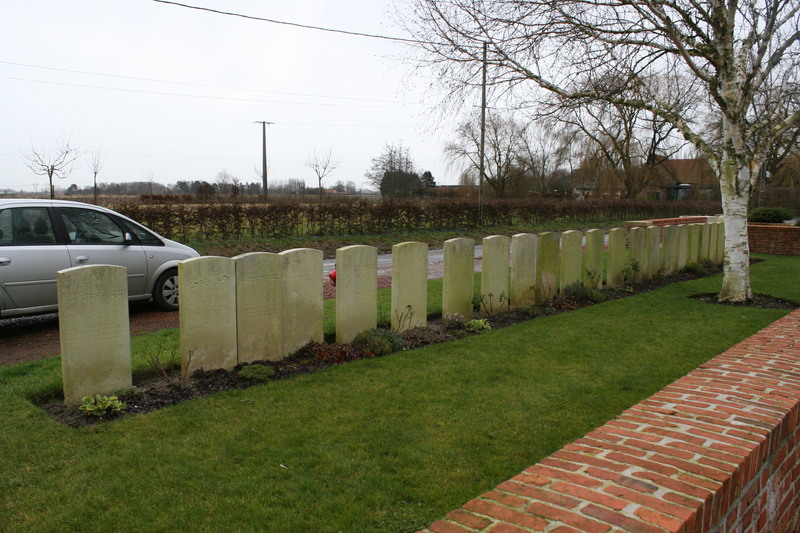 Of these, thirteen headstones bear the date of 19th July 1916, the day the Australians attacked at Fromelles, and where we shall find ourselves at a later date. 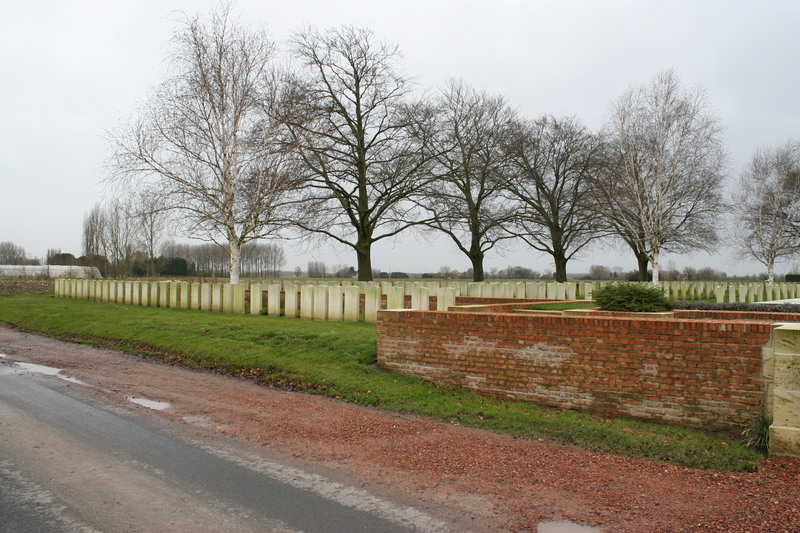 At the time of the Armistice there were 335 burials here, but this was later increased to nearly 900 as bodies were brought in from the nearby battlefields, and from a number of smaller, mainly communal, local cemeteries and churchyards. 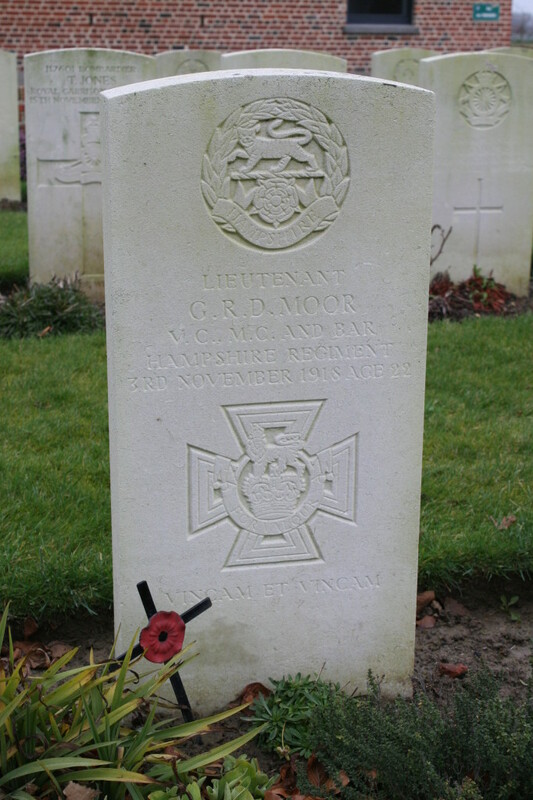 George Moor died of Spanish flu just a week before the Armistice, and was originally buried at Mouvaux Military Cemetery, on the outskirts of Lille, before later being reinterred here. 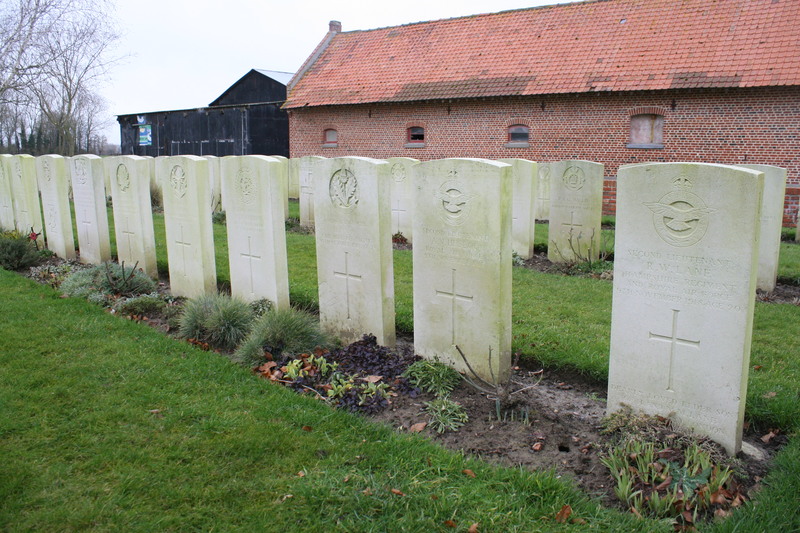 Two decorated artillerymen in Row A, who also lost their lives just days before the Armistice. 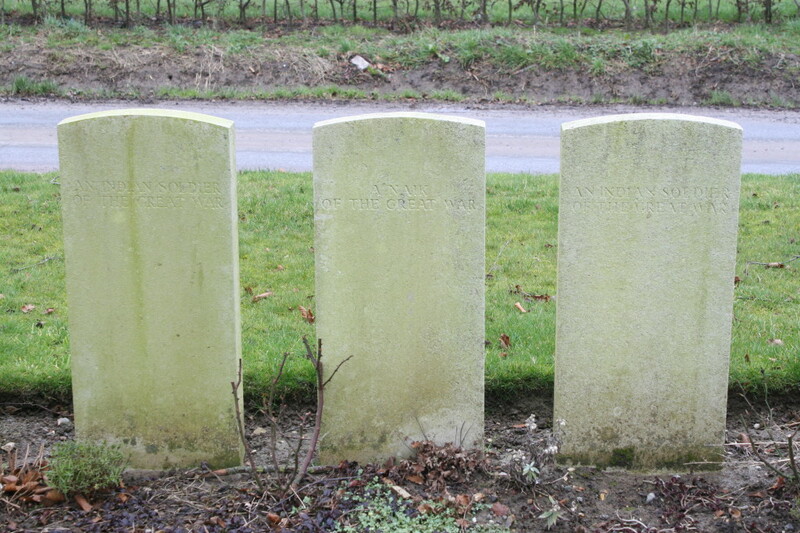 Further along the same row, these three South Africans met their fate in a very different way. 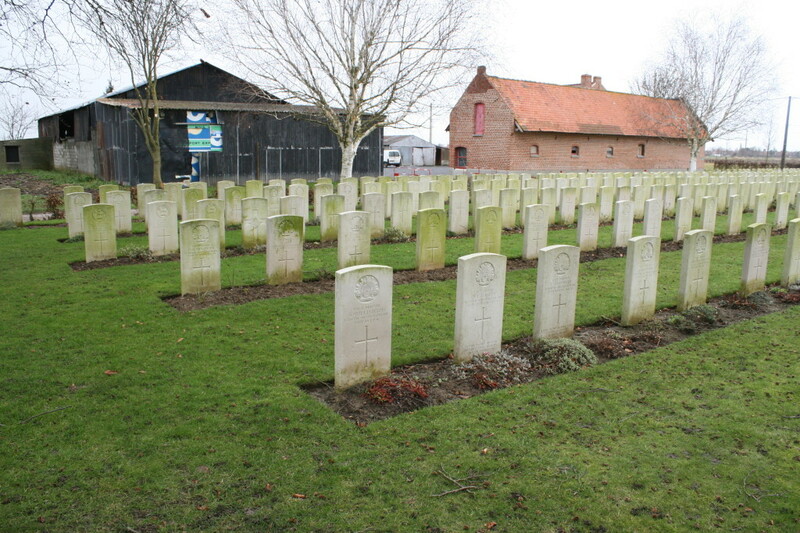 Privates Willie Harris & Abraham Davids, 1st Battalion Cape Coloured Labour Corps, were executed together in Lille on 26th August 1919 for the murder of a Labour Corps colleague, Private Barend De Vries. 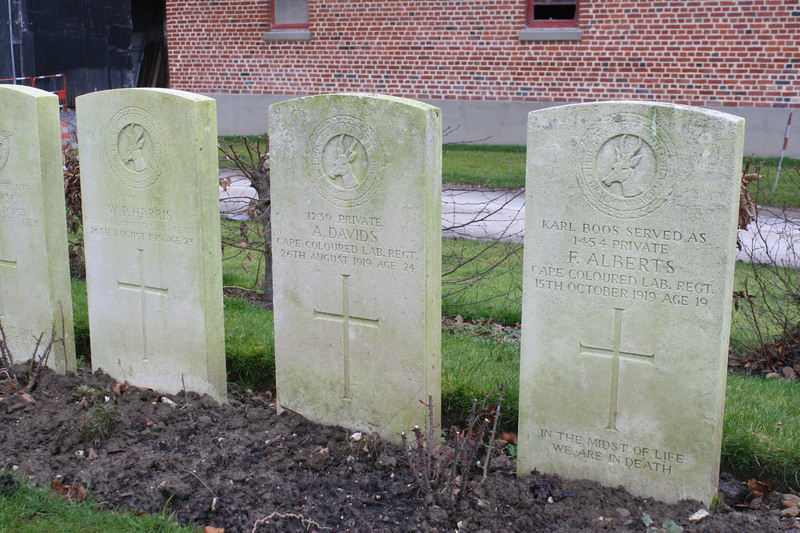 Two months later, Private F. Alberts, actually an alias for the family name of Boos, was also executed in Lille for murdering two Belgian civilians. The firing squad failed to kill him and a Sergeant had to apply the coup de grâce. 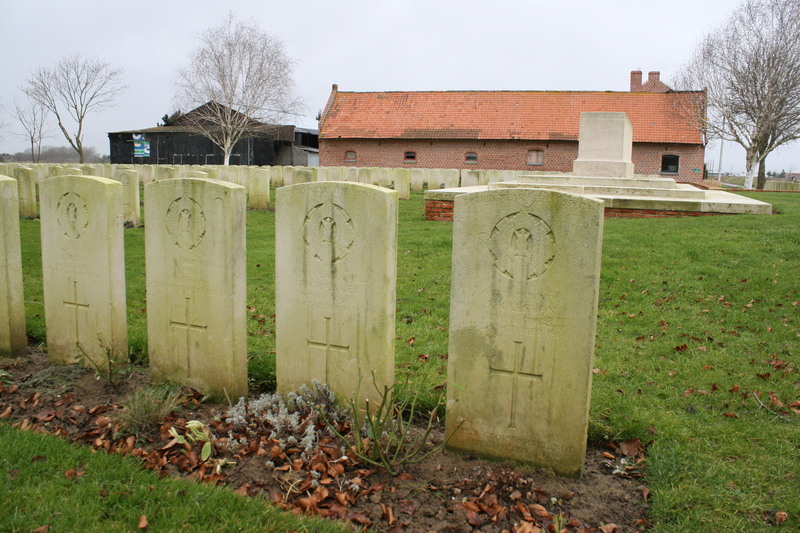 All three were originally buried in Mouvaux Military Cemetery, but were later moved here. 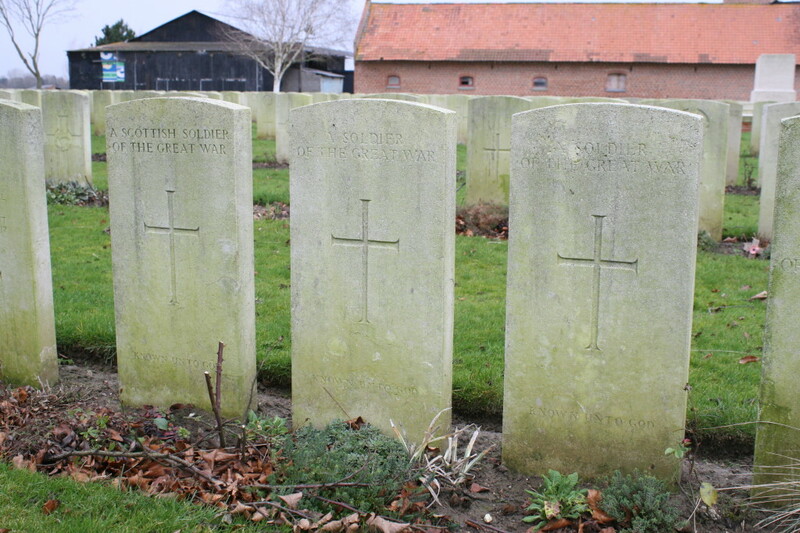 They were among the last men to be executed during the Great War. 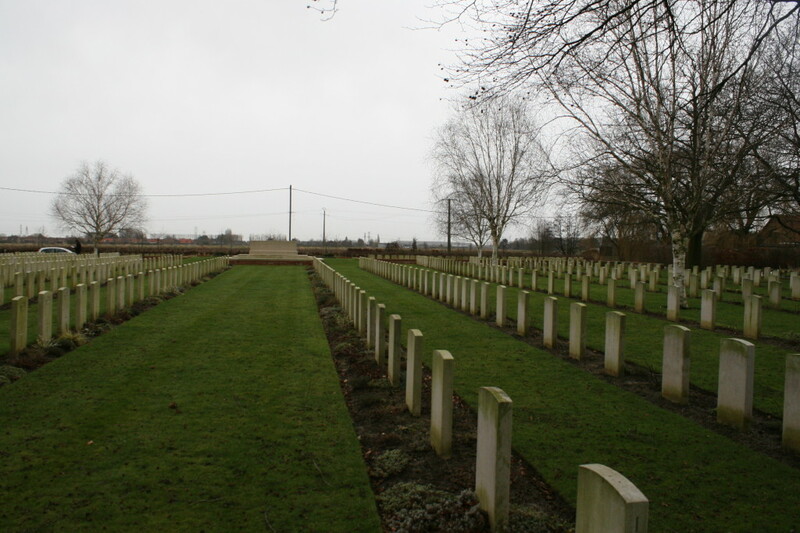 By the end of the war Mouvaux Military Cemetery contained the graves of 51 British servicemen, a single Canadian, and the three South Africans, all of whom were moved here post-war. 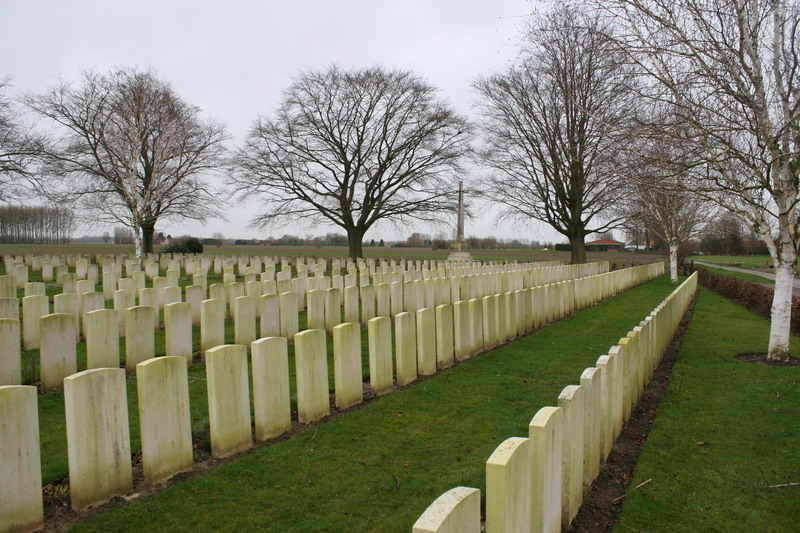 Looking south east, Row B in the foreground. South eastern view across the cemetery. Two R.A.F. 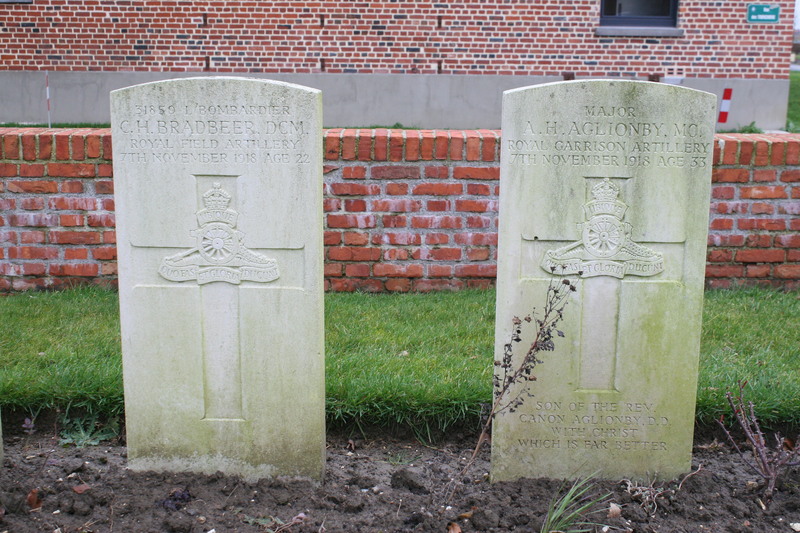 casualties in Row C. Second Lieutenants Albert Victor Heslop and Reginald William Lane, pilot and observer in an R.E.8, were shot down on a reconnaissance mission just two days before the end of the war. Sadly, their Casualty Cards note that they had been posted missing for seventy two hours just ten days earlier, before they turned up safe and sound and the missing report, the card states, was cancelled. And so we leave Y Farm and begin our journey north. This final montage clearly shows the Indian graves to the left and right of the cemetery entrance. 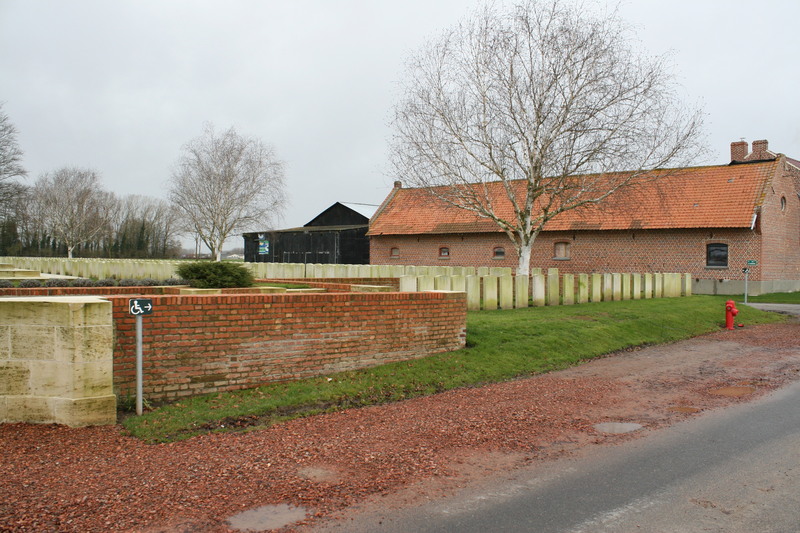 This entry was posted in French Flanders, The Nursery: Bois Grenier to Houplines. Bookmark the permalink. Can’t believe I forgot to say thanks Morag!! Hello Lou! Brilliant to hear from you. So pleased you found Bertie, and yes, expect a mail over the weekend (I shall head it theBigNote or similar – check your spam just in case) – I would very much like to see your photos etc to see how the cemetery now looks. Hope all is well.